THE BIOLEXA PLATFORM IS A PROPRIETARY, PATENTED ANTIMICROBIAL THERAPY. The Platform is based on cutting-edge scientific research from Univ. of Cincinnati (PNAS 2008, PNAS 2013, Biochemical J. 2017, Protein Science 2017). 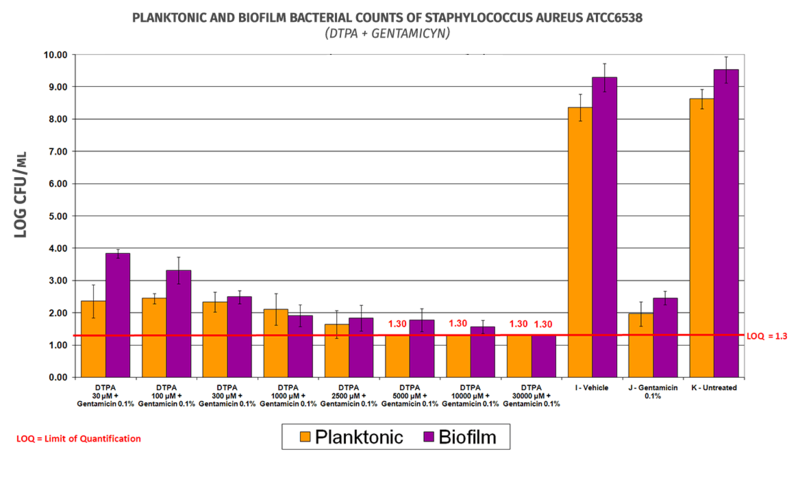 Centers for Disease Control data indicates that “biofilms” are implicated in over 2/3 of all skin infections. Biofilms are specialized bacterial colonies that are resistant to antibiotics and immune system responses. Moreover, staph bacteria require zinc to form the biofilms that allow the bacterial colonies to grow and resist treatment. The BioLexa Platform is a synergistic combination of a zinc chelator and an antibiotic that prevents biofilms from forming, leaving the bacteria susceptible to elimination by the antibiotic. 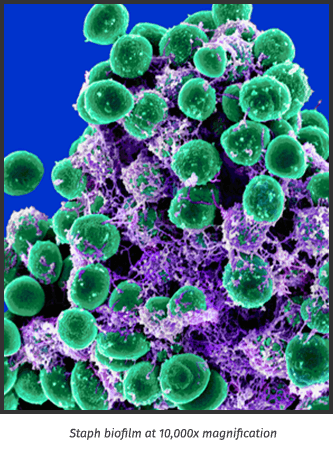 Biofilms are specialized colonies of bacteria that adhere to a surface and to one another. The bacteria growing in a biofilm are highly resistant to antibiotics and immune responses. As a result staph biofilms cause recurrent, hard to treat infections. The Staph biofilms form when thread-like thread-like proteins (Aap or SasG) on the bacterial surface stick to one another holding the cells together. The Herr Lab, run by Dr. Andrew Herr at the University of Cincinnati discovered that these proteins only become adhesive when exposed to zinc ions. The BioLexa Platform traps all the zinc ions by adding a chelator called DTPA, which prevents Staph biofilm formation. In pre-clinical testing on animals, the BioLexa Platform showed impactful results. The University of Miami tested the ability of BioLexa’s DTPA chelator to synergize with the antibiotic in an animal study. Specifically, the pre-clinical study introduced high levels of Staph bacteria to wounds on the skin of pigs, as pig skin is the closet animal model to human skin. The results, as set forth in this chart, show significant reduction in bacterial infection. In some cases, the bacterial count was below detectable levels.